We all have things that we want to achieve in life, including our martial arts. This could be achieving a Black Belt, or doing well at your next grading or tournament. In class, we regularly help you set those goals and work with you to achieve them. We make your dream specific and actionable. Having a goal is the first step of the process. You must also have a good martial arts system to get you where you want to be. For example, your goal may to be to earn your Black Belt. The system, in this case, is the syllabus you learn to get you there. However, what if you completely overlooked your goals and focused only on the system (read syllabus and technique)? Would the results be the same? For example, try ignoring chasing a belt or your next tournament result. Instead, focus on the day-to-day training and repetition of mastering your syllabus. Would this be better for you? This is my mindset at the moment and I believe it does help you progress with your martial arts. As an example, I did a pure boxing workout this morning (as a part of my overall martial arts training). I counted that I did 2,000 punches in this one workout. Now, I do not always just focus on my boxing. I also do kicking, throwing, grappling and other self-defence techniques. But if I annualise this figure, it could come to hundreds of thousands of punches thrown each year. They say you must do something 10,000 times to be good at something. So I am being good quite a few times each year. It is amazing when you stop to think about it. I never set a goal for my boxing (noting that strikes are one part of the martial arts system I practice). I do not measure myself against other pure boxers. I never set a punch goal. But what I did focus on was performing my boxing workout as part of my overall structured martial arts training program. And by sticking to my training program, that ends up being tons and tons of punches. I focused on my martial arts system and the process of doing the workouts, rather than a long-term goal. In the end, I believe I enjoy better results. Now, I am not saying that you should only work the system and forget the goals. You must absolutely have goals. However, I am saying that you should not just focus on the goal. Focusing on the training the system, through daily repetition, is just as important. Why? When you set a goal, you are essentially saying that you are not at that level yet. But you could also be saying, “I will be good once I reach that level”. The problem with this is that you are putting happiness off until you reach your goal. This may take a really long time. Instead, if you focus on the system and doing well in each and every workout, you can more regularly feel happy with your progress. This will also help with your improvement. Goals do not always help with your long term progress. 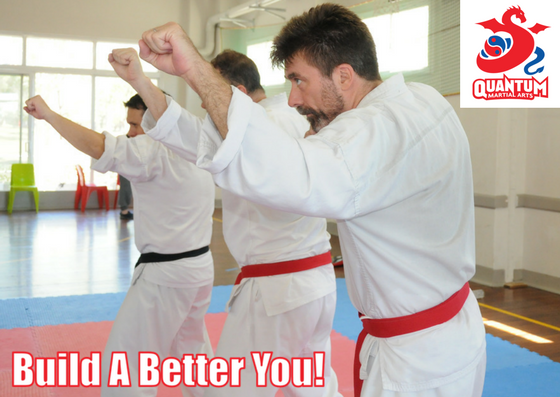 In martial arts, you always have regular goal accomplishment with each grading. However, what happens when you reach your Black Belt? Does that mean that you stop training? Absolutely not. Any martial artist who has achieved Black Belt knows that the true training only starts once you have your 1st Furthermore, it can be difficult to progress further in the Black Belt ranks unless you have an excellent knowledge and application of your kyu (before Black Belt) techniques. Therefore, focus on the practicing your system rather than just the goal (e.g. Black Belt), and this will help make you a far better martial artist. There are certain things in life you can control, while there are other things that you just cannot control. You cannot always control when you will achieve a goal, e.g. Black Belt. There are so many circumstances or situations that may arise along the way. So, focus on the daily practice of the system. You have control over this. With the above points, I am not saying to lose sight of the long-term goal…not at all! But achieving a Black Belt can take many years. This is a long time to keep the focus on one thing. If you focus on the daily practice of your system, you get a sense for how you are progressing. This will keep you happy and motivated. Oh, and before I forget, always seek feedback off your instructors. Always apply what they are telling you. This will help you know how you are progressing. This will also help keep the focus on the perfecting the system (which is the “here and now”), rather than just aiming for the goal (as nobody can predict the future). Goals are good for planning your progress and systems are good for actually making progress. Goals can provide direction and even push you forward in the short-term, but eventually a well-designed system will always win. Having a system is what matters. Committing to the process is what makes the difference. So, what system do I use? I choose to train in the Northstar Ju Jitsu (NSJJ) system. NSJJ has evolved from 2 of the most significant and famous Japanese Ju Jitsu systems; Daito Ryu AIki Ju Jitsu (the main influence on modern Aikido) and Tenjin Shin-yo Ryu (one of the main systems that was instrumental in the development of modern day Judo). Northstar Ju Jitsu is unique in that it immortalises the spirit of the ancient samurai in modern society. The program is a newer, evolved approach to martial arts and life relevant to our society and culture. Northstar Ju Jitsu integrates modern and traditional elements of Ju jitsu, into a holistic practice of self-defence, fitness and mindfulness. It has everything that I am looking for, while really helping me progress as a martial artist and person. But, I do not have a long-term goal to achieve a certain belt / level at NSJJ. Instead, I focus on the system and dedicate myself to improving on a day-by-day basis. I believe it is the main way to improve. Try it….I am sure you will agree. Ous! If you like this blog, please feel free to share it with anybody you feel will get value from it (using the links below). Thanks for reading.